Sending out thankfulness one galaxy at a time. I was invited by LeftsideSF to create a mural at Playland's skatepark. 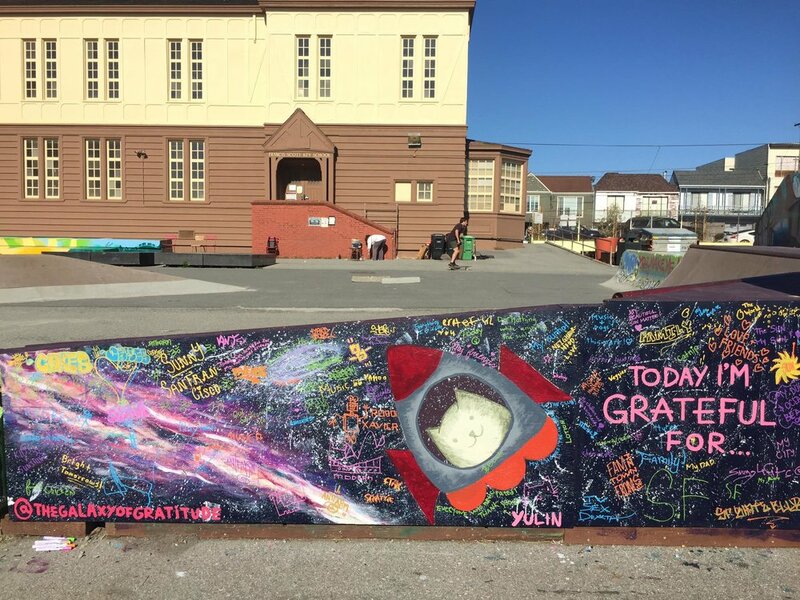 The Gratitude Wall is a piece of interactive mural piece created by the community, I did the base painting and have participants on Playland's one year anniversary to write their gratitude on the wall. I had no idea how to paint a mural and to be very honest this is the first time I ever even painted on a wall, and the first time I use acrylics to paint. I watched hours of Youtube video again. I kept a spot just to know where everything is going to be. I was totally stressed about the uncertainty, but then I decided I was going to wing it and figure it out. I didn't even know what color of paints I'm going to be getting. The park provided paints and I gave them some ideas of the colors I needed. I am so grateful to be supported by my dear friends. Without them, I won't be able to push myself so hard to finish the wall. They kept me company as I was painting the wall. This is the first person who wrote on the wall that day. And I'm grateful for someone who's willing to take the first step. "My Super Nova 😍Thank you @thegalaxyofgratitude for adding such a special touch to Playland ❣️This was my daughters favorite part of the day!" When I saw the comment the mother of the little girl in the picture left on my IG, I knew that this is the right path to take. I'm doing what I believe and it makes people happy. This experience was amazing, I go back to Playland sometimes just to read the gratitude people wrote on the wall. I consider myself as the curator of the project but the owner of the art piece. This is a piece of art that's created by the community and everyone who participated is a part owner of it.